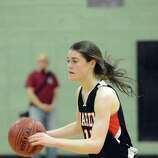 The Fairfield Warde girls basketball team was looking for a positive note in its regular season finale at Harding. The Mustangs got 20 points and five rebounds from junior center Brielle Lanese and 10 points, four rebounds and four steals from junior guard Kate Kerrigan as the Mustangs held off the Presidents, 56-48 on Wednesday at Harding High School. "It was a good win," Kerrigan said. "We definitely needed it for states." Senior Bree Natale chipped in eight points, four assists, four rebounds and three steals and Jamera Fountain added 11 points as Warde won for the fourth time in five games. Warde closed its regular season 11-9. "Some of these kids got minutes that they don't ordinarily get," Warde coach Dave Danko said. "They got positives out of it." Harding was led by freshman Brae Stewart, who scored 15 points. Junior Neish Franco scored 12 for Harding as well. The Presidents finished the year 3-17. "They hit some shots down the stretch," Kerrigan said. "We pulled it together and played good defense and got the win." The Mustangs used a 19-2 run between the first and second quarters to open up a 15-point advantage. Lanese and Kerrigan each had six points on the run and Warde's defense held Harding without a field goal for 8:30. But Harding was scrappy the entire night. The Presidents closed the half outscoring Warde 7-2 to cut the Mustangs advantage to 29-18 at half. Even despite a 11-5 opening to the third quarter which peaked Warde's lead at 40-23, the Presidents answered with a 12-2 run to close the third and make the fourth quarter competitive. "[Harding] ran a great press breaker," Danko said. "We got caught two or three times, and that kept us on our toes." However, whenever the Presidents got to within striking distance Warde had an answer. Senior guard Maggie Winstead hit a key shot at the end of the third which raised Warde's advantage to 10 again. "Different girls experienced pressure situations," Danko said. "They did well." Kerrigan, Natale and Lanese each scored four points in the fourth quarter. Senior Taylor Bargmann chipped in two points and seven assists in the game and Jerelyn Luther scored three points and grabbed 11 rebounds. The Mustangs will now wait for the Class L playoffs, which will begin on Feb. 28. Warde will likely have to play a road playoff game. "We're getting ready to hopefully win our first round playoff game," Danko said.